Till date we have heard only of Chandragupta or Ashoka when it come to talking of monarchs of ancient India. But there have been Samrat of very ancient India too i.e the pre-Mahabharata era. 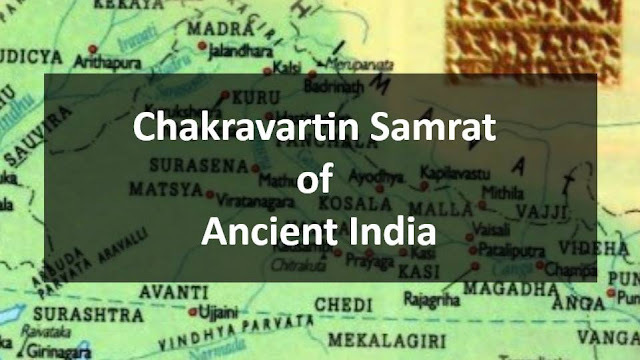 Today, I am going to list the Chakravartin Samrat of pre-Mahabharata era. But first, let us see who qualifies to be called the 'Samrat' of India. A Raja or king is like a ruler of a small kingdom, generally chieftain of a tribe or community. A Maharaja or an emperor is the ruler of a large kingdom, significant enough to influence the politics of the area. And finally, a Samrat is the one who rules the entire or major part of Bharatvarsh and has others under his sway. A typical way of going up the ladder was either by performing Ashwamedha or Rajasuya Yagyas or physically capturing the territories. Ashwamedha was a famous practice in ancient India. Rajasuya Yagya isn't heard of much. A Samrat is an ideal ruler who is considered to be the epitome of justice and power. He has a specific term given to him- Sarvabhauma or who has all land (Bhumi) under his sway or Bahuvruhi or whose chariot has no obstruction of moving anywhere. And to add to this list, we have Yudhishthira Pandava, again a Chandravanshi Puru and Kurujangala kingdom. Harivansha (1.13.25) mentions king Harishchandra of Ayodhya as a Samrat. 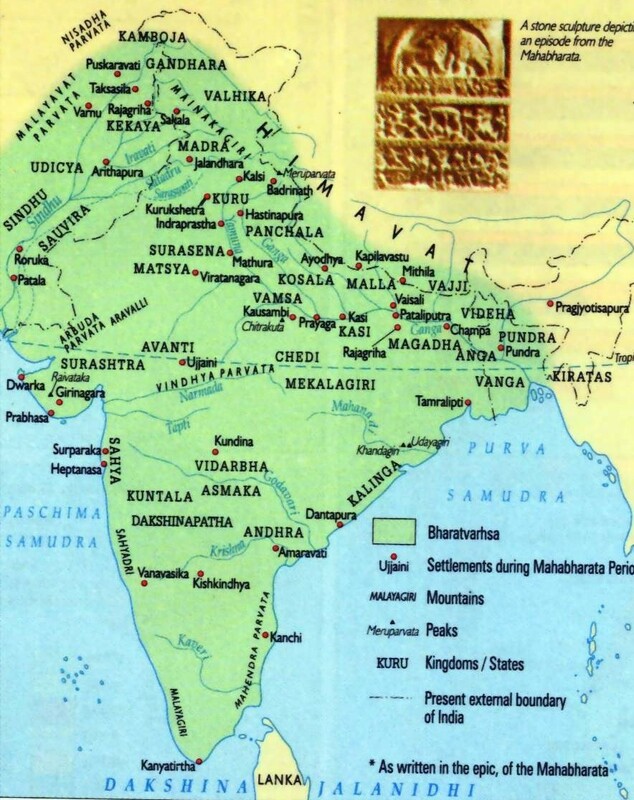 A map of ancient India is given which will make it easy to visualize the geography of the kingdoms. The list varies a bit in other sources but more or less, this is the actual list. A few extra kings that could have been Samrats are Ajamidha Vaikuntha of Purus, Kartavirya Arjun of Haiheyas (Yadavas). Suhotra Atithina is also a composer in Rigveda and belongs to the Bharadvaja group of composers. Atithina is a corruption of Vidathina, another name of Bharadvaja Barhaspatya. He is almost 5 generations after Bharata. His kingdom is same as Bharata. Shivi Aushinara belongs to the Anu group who ruled the 5 rivers of Punjab in today's Pakistan. Yayati Nahusha is almost 27 generations before Bharata. He was the guy who ruled almost all of north India. Puru, Yadu, Turvasu, Druhyu and Anu were his 5 sons from whom the major kingdoms of north India sprung. So you can imagine the area he ruled. Shashabindu Chaitrarathi is a Yadava whose daughter Bindumati was the wife of Mandhata Yuvanashva, another Samrat from Ayodhya. Shashabindu's kingdom was around Gujarat and Rajasthan. He is almost 11 generations before Bharata. Gaya Amurtarayas belonged to the Kanyakubja kingdom (of whose Vishwamitra was the king before becoming a rishi). This kingdom is near Kannauj. Rantideva Sankruti ruled around the Chambal river in Rajasthan and MP,called Charmanvati then. He was famous for his ability to share his belongings. Sankruti is an Angiras gotra among brahmins. Now talking of all Suryavanshi kings from Ayodhya. First let's arrange them chronologically. Ambarisha Nabhagi , Mandhata Yauvanashva, Sagara Aikshvaku, Bhagiratha Dileepa, Dileepa Khatvanga and Ram Dasharathi. All these ruled at Ayodhya in UP. This family line itself has maximum Samrats. Ambarisha Nabhagi is son of Nabhag who is the son of Vaivasvata Manu and not of Nabhaga who was another king of Ayodhya. Out of these, Mandhata and Ambarisha are composers in Rigveda. The Second Battle of Panipat was fought between the forces led by Hemu (the general and chief minister of Adil Shah Suri) and the forces of the of the Mughal emperor, Akbar. The battle was fought on November 5, 1556. After the death of Babur(founder of Mughal empire), Humayun succeeded the throne of Delhi. However after the Battle of Kanauj (17 May 1540) Sher Khan(Sher shah Suri) became the master of Agra and Delhi. Mughal Empire was put to an end for a while and Humayun lived in exile for next 15 years because of this Short Sur Dynasty founded by Sher Shah Suri. Later Islam Shah Suri ascended the throne of Sur dynasty after the death of Sher Shah in 1545 at Kalinjar. Islam Shah Suri was a capable ruler, but died in 1554. With these two deaths the Sur Empire was caught up in a succession battle. Humayun used this perfect opportunity for the Mughals to march back to India and regain the lost power in 1540. Humayun with Bairam Khan (commander-in-chief of the Mughal army) fought the Battle of Srihind againt Sikandar Shah Suri in 1555 and became victorious. The Mughal Empire was finally regained control over Delhi and Agra after 15 years. Islam Shah was succeeded by his 12-year-old son, Firoz shah suri. But after a short period Adil Shah Suri maternal uncle of Firoz shah murdered him and ascended the throne of sur Empire. He appointed Hemu (general of the Suri forces) as his Chief Minister. Most of the affairs of the state were left to Hemu as Adil Shah Suri was interested in luxury and pleasure. Later Humayun died on 27 January 1556 and succeeded by Akbar. Bairam Khan was appointed regent over the young king Akbar. Tardi Beg Khan was the governor of Delhi when Humayun died. Humayun's death provided a great opportunity for Sur dynasty to defeat Mughals and regain the lost territories. Hearing about the death of Mughal leader, Hemu made a quick march and conquered Sambhal, Bayana, Kalpi, Narnaul and Etawah. Hemu continued to Agra and by hearing about the invasion, the governor of Agra fled away without a fight. And later Hemu reached Tughlaqabad, where he ran into the forces of the Tardi Beg Khan (Mughal governor of Delhi), and defeated them in the Battle of Tughlaqabad. Then Hemu took possession of Delhi after the battle and claimed royal status, assuming the assuming the title of Raja Vikramaditya (Samrat Hemachandra Vikramaditya). With the news of Tughlaqabad, Akbar and Bairam khan started to Delhi. On November 5 1556 Mughal army met Hemu’s forces on the battle field of Panipat. Earlier, before the battle Hemu lost his artillery to the Mughals, still his forces are large in numerical to Mughal forces. Hemu himself led his forces into the battle field. While the mughal army was led by by Ali Quli Khan Shaibani in the centre with Sikandar Khan Uzbak in the right wing and Abdulla Khan Uzbak in the left wing. Akbar and Bairam Khan stayed in the rear. Finally On November 5 1556 Mughal army met Hemu’s forces on the battle field of Panipat. With his 30,000 Rajput and Afghan cavalry and 1500 war elephants, Hemu started war on Mughals. 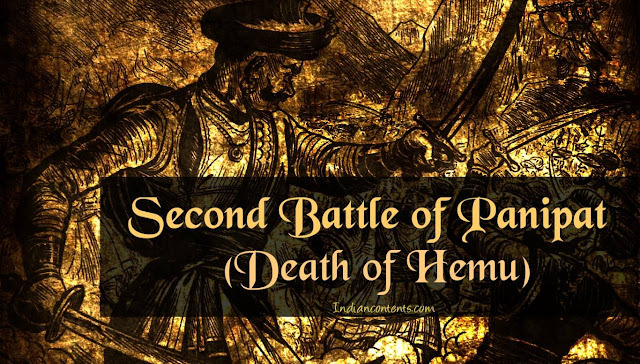 Hemu’s forces held the upper hand on Mughals and pointed towards winning the battle. But all of a sudden an arrow was hit in the eye of Hemu and he fell unconscious on his elephant (Hawai). This turned the fate of battle into the hands of Mughals. Seeing their commander falling, Hemu's army panicked and Mughals stood victorious in the battle. An arrow was hit in the eye of Hemu in the battle and he fell unconscious on his elephant (Hawai). The elephant carrying the wounded Hemu was captured by Shah Quli Khan and brought to the Mughal camp at Shodapur on Jind Road at Panipat. Bairam Khan (Regent at the court of the Mughal emperor) requested Akbar (13 year old) to behead Hemu so that he could earn the title of Ghazi (Warrior of the Faith). But Akbar refused to use his sword to a defeated and dying Hemu. After Akbar's refusal Hemu's body was denied honour by the Mughal battle tradition and was unceremoniously beheaded by Bairam Khan. Later Hemu’s head was sent to Kabul and his body was hung at Purana Khila. Later Hemu's Smadhi Sthal, a memorial to the king Hemu was constructed at Shodapur village on Jind road near Panipat where he was executed. 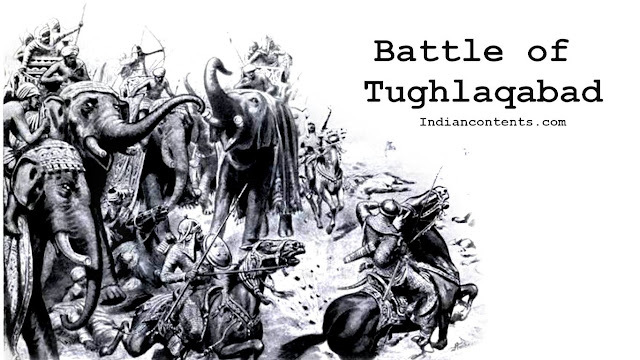 The Battle of Talikota was fought by the Vijayanagara force lead by Aliya Rama Raya against the invading forces of the united Sultanates to the north of Vijayanagara (i.e. consisting of Bijapur, Ahmadnagar, Golkonda, Berar and Bidar Husain Nizam Shah, Ali Adil Shah and Ibrahim Qutb Shah). 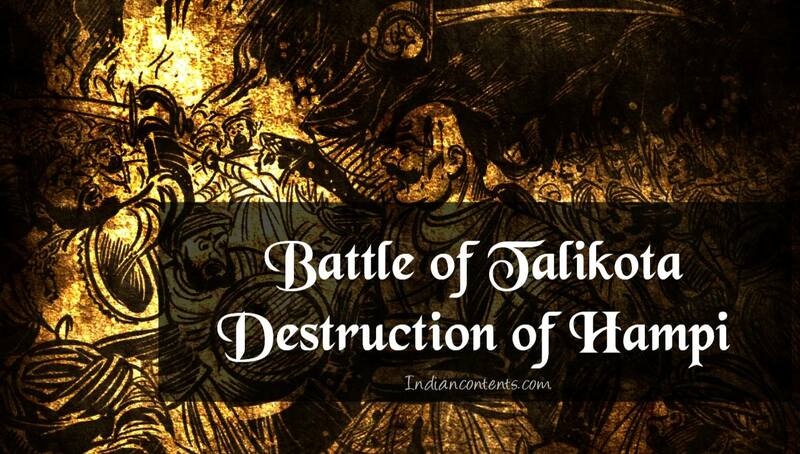 The battle took place on 23 January 1565 at Talikota (In Present Karnataka State). Some scholars say the armies fought near Rakkasagi and Tangadigi villages. Hence the battle is also referred as the Battle of Rakkasa-Tangadi. Some other scholars believe that battle was fought at Krishna-Bannihatti. Hence it is also known as the battle of Bannihatti. After the death of Achyuta Deva Raya in 1542, Venkata Raya asseended the throne. Later Venkata Raya was killed in 6 months and Sadashiva Raya (minor nephew of Achyuta Raya) ascended the Vijayanagara Throne. Rama Raya appointed himself regent and controlled Sadashiva Raya. Rama Raya acted as actual ruler confining Sadashiva Raya. He replaced the loyal servants of the kingdom with officers who were loyal to him. Later Rama Raya appointed the Gilani brothers (two Muslim commanders) as commanders in his army, a mistake that ruined the empire. These Gilani brothers were earlier in the service of the Sultan Adil Shah. 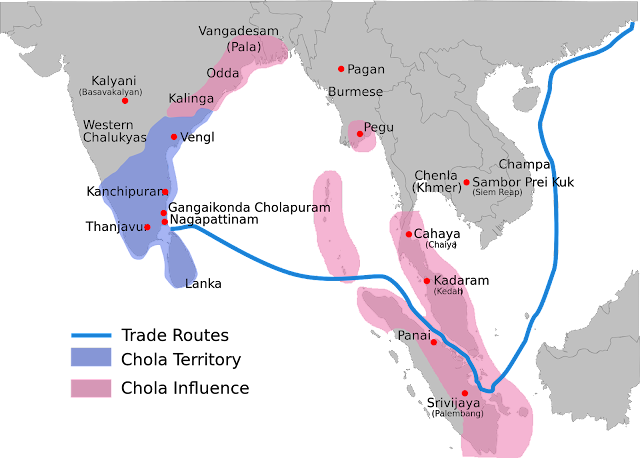 During this time, the Muslim kingdoms (Deccan Sultanates) were suffering from internal disputes. Seeing this disputes as an advantage Rama Raya interfered in the internal fights of the Deccan Sultanates (Shahi’s). He tried to follow the divide and rule policy between the Muslim Kingdoms and crush them. But soon Shahi’s realized the plan of Rama Raya and united to form a huge Shahi forces (consisting of Husain Nizam Shah, Ali Adil Shah and Ibrahim Qutb Shah) against Rama Raya through various matrimonial and other alliances. The main cause for the battle was Rama Raya’s refusal of returning the Raichur to Ali Adil Shah, which invited both the forces to the battle of Talikota. The united Deccan Shahi Sultans attacked Vijayanagara forces led by Rama Raya on 23 Jan 1565 in the battle of Talikota. Rama Raya led the army very effectively and the Vijayanagara army was holding upper hand in the battle. All of a sudden the Gilani brothers, two Muslim commanders turned against Ram Raya and switched their side to united Shahi’s. Gilani Brothers captured Rama Raya and beheaded him on the battle field. This created a confusion in the Vijayanagara forces and finally resulted in the defeat of Vijayanagara Empire. United Shahis followed by the victory in battle entered the Vijayanagara Empire. They destructed and looted everything. Finally they plundered Hampi and reduced it into ruins. Vijayanagara, once a city of fabled splendour, the seat of a vast empire, became a desolate ruin, now known by the name of a sacred inner suburb within it, Hampi. Robert Sewell, in his book The Forgotten Empire, concludes thus - "With fire and sword, with crowbars and axes, they carried on day after day their work of destruction. Never perhaps in the history of the world has such havoc been wrought, and wrought so suddenly, on so splendid a city; teeming with a wealthy and industrious population in the full plenitude of prosperity one day, and on the next seized, pillaged, and reduced to ruins, amid scenes of savage massacre and horrors beggaring description." Tirumala Deva Raya brother of Rama Raya fled from the battle to Vijayanagar. Tirumala then moved to Penukonda along with the minor prince Sadasiva Raya, and some members of the Royal Family,and with whatever treasures he could find in the capital just before it was sacked and destroyed. He later restarted the empire from Penukonda. Thus was the Aravidu dynasty was born. 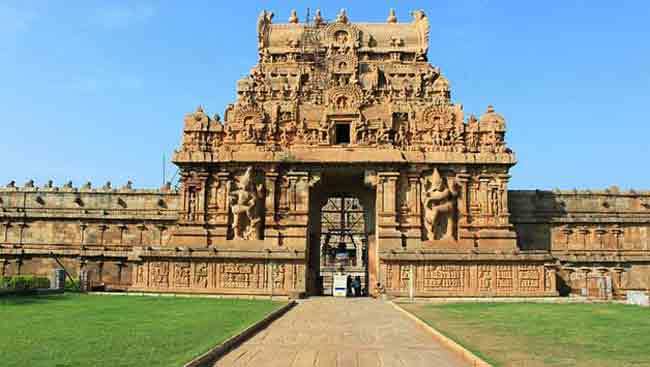 His reign was marked by revolts of the Gingee Nayakas and Madurai. He later renounced the throne, dividing it among his three sons, Sriranga( Penukonda), Rama( Sri Rangapatna) and Venkata( Chandragiri). The Battle of Delhi also known as the Battle of Tughlaqabad was fought between the forces led by Hemu (the general and chief minister of Adil Shah Suri) and the forces of the Mughal led by Tardi Beg Khan. The battle was fought on 7 October 1556 at Tughlaqabad near Delhi. Humayun's death provided a great opportunity for Sur dynasty to defeat Mughals and regain the lost territories. Hearing about the death of Mughal leader, Hemu made a quick march and conquered Sambhal, Bayana, Kalpi, Narnaul and Etawah. Hemu continued to Agra and by hearing about the invasion, the governor of Agra fled away without a fight. This news reached the Tardi Beg Khan and he wrote to his master Akbar in Jalandhar explaining the situation for reinforcements to defend Delhi. Bairam khan sent Pir Muhammad Sharwani (lieutenant) to Delhi. Finally Tardi Beg Khan made all the preparations to stand and fight Hemu. After winning Agra, Hemu reached Tughlaqabad near Delhi where he faced Mughal forces. According to Abd-ul-Qadir Bada'uni (a historian and translator lived in the Mughal Empire), Hemu's forces were well equipped with 51 cannon, 500 falconets, 1000 elephants and 50,000 horses. Andthe Mughals were outnumbered. According to Jadunath Sarkar (a prominent Indian Bengali aristocrat and historian), the Mughals were commanded by Tardi Beg in the centre with Haidar Muhammad and Iskandar Beg leading the right and the left wings. Abdullah Uzbeg commanded the vanguard. The cavalry in the vanguard and left wing launched an attack to beat back the Afghan vanguard along with Hemu's right wing. In this assault Abdullah Uzbeg and Iskandar Beg captured 400 elephants and 3,000 of Hemu's men lay dead. Imagining that they won the battle, many of Tardi Beg's forces pursued the enemy camp to plunder the wealth, and Tardi Beg e was left in the field very thinly guarded. Hemu, however, had held back 300 of his best elephants and cavalry unit in reserve. Seizing the opportunity, he made a sudden charge on thinly-guarded Tardi Beg with with his reserve. And this attack was also supported by the timely arrival of fresh reinforcements from Alwar under the command of Haji Khan. Seeing the troop of war elephants and dense cavalry advancing upon them, many of the Mughal officers fled away in terror without waiting to offer a defense and Tardi Beg along with Pir Muhammad Sharwani fled away. Later the previously victorious Mughal vanguard and left wing returned from their pursuit, and left without offering a fight realizing they lost the battle. Thus Afghans won the battle. Hemu took possession of Delhi after the battle and claimed royal status, assuming the assuming the title of Raja Vikramaditya (Samrat Hemachandra Vikramaditya). Following his failure, Tardi Beg was murdered by Akbar's regent, Bairam Khan. After 1 month Hemu would fought again with Mughals in second battle of Panipat. 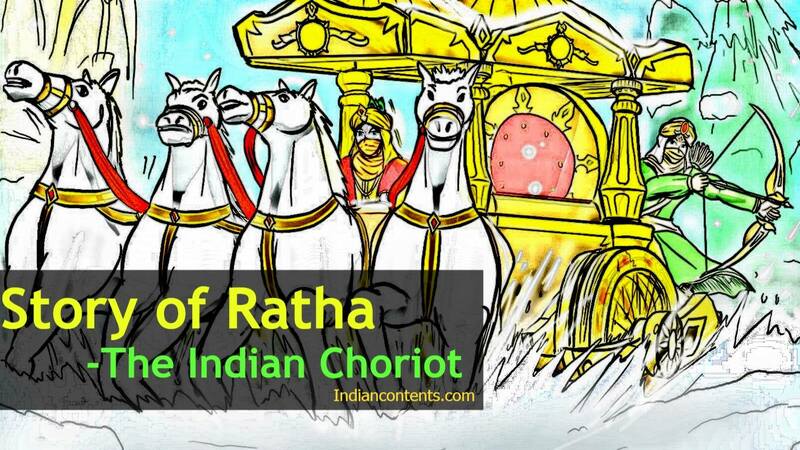 Ratha, or the chariot is considered to be the best mode of transport in ancient India, especially during wars. It symbolizes energy and the zeal to move forward. But do we know everything about what is a Ratha ? The development of Ratha can be imagined. First man used to walk and travel. Later on, he started to ride the back of animals which was quite tedious but faster than walking. But some brilliant mind got the idea of a wheel and thus constructed a chariot moving on wheel which would be pulled by muscle power of animals while man can comfortably sit in the chariot. Thus began the science of building a Ratha. Further developments took place. The wheels used to have spokes for higher speeds and for being light in weight. Almost every God had a Ratha. Hymns from Rigveda talk of Rathas of Indra, Agni, Ashwini Kumars, Usha,etc. Almost every king at war had a Ratha. Mahabharata and Ramayana wars have ample references to kings fighting on Rathas. Why others ? Our very own Krishna spoke the verses of Bhagvad Geeta on a chariot. We have an extra special hymn in Rigveda. It is 6.75. It is composed by Payu Bharadvaja. King Prastoka Sarnjaya had sought help from Payu to win a war. So Payu created this hymn in praise of all war-related things including bow, arrow, Sarathi, Ratha, different parts of Ratha,etc. It contains information about different parts of Ratha. Apart from this, horses having 34 ribs were used in wars and to draw Rathas. Now, a Ratha should have specific dimensions to bring the best out of it. For that, we have different Shulba Sutras which describe how a Ratha should be constructed. The Ratha also inspired construction of temples. The best example is of Konark temple in Udisha. The Ratha had become such an integral part of people's life, that it seeped into Sanskrit language. Karni Ratha- Special Ratha for women, particularly queens. Vainayik Ratha- For giving training of driving a Ratha. Pushya Ratha- For processions of kings. Kreeda Ratha- For competitions and races. Even rituals needed Rathas. A Vajpeya Yagya needs a special Ratha "constructed from wood and having wheels with 17 spokes. ". What ever may be the archaeological excavations, one thing is for sure, Rathas had a very dear place in the hearts of our ancestors, just like horses. !! !